Endeavor Global is welcoming a new President, Adrian Garcia-Aranyos, who will assume the role after Fernando Fabre’s eight years of leadership. Adrian has served as the Managing Director of Endeavor Spain since its launch in 2014. 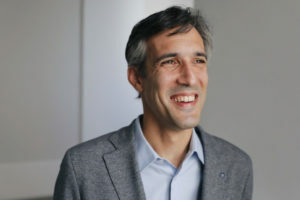 Under his leadership, as Endeavor’s second office in Europe, Endeavor Spain has grown to support 34 entrepreneurs leading 28 companies, many of whom have grown to be top performers in Endeavor’s worldwide network today, and play vital roles in continuing to grow Spain’s entrepreneurship ecosystem. Adrian is a true global leader in Endeavor’s network, and as Endeavor Global President, he will be a full partner in leveraging the power of Endeavor’s teams, boards, entrepreneurs, and network around the world. Adrian Garcia-Aranyos of Endeavor. Kieran Kesner for Endeavor. In advance of the transition, we asked Adrian a few questions about the road from Madrid to New York City, the lessons he’s learned along the way, and his vision as a leader in the high-impact entrepreneurship movement. Endeavor: What were you doing prior to working with Endeavor? Adrian: Prior to working at Endeavor I spent a few years at JPMorgan Chase heading the Latin America Corporate Communications and Media Relations area, and before that I had an extensive career at The Economist Newspaper Group, where I always need to clarify I was part of the business side not the editorial staff. There I ran Marketing for the EIU, then moved to co-heading Latin America for the group, and finally moved to Head Americas Marketing for the Brand Innovation Business unit. Great experience, but above all, great bosses all along the way. E: How and when did you get involved with the entrepreneurship ecosystem and Endeavor? A: I first got involved with Endeavor back in 2006. At the time, I was working at The Economist, and my target readers, advertisers, sponsors and partners all seemed to lead me to Endeavor so I was intrigued. I had the opportunity to meet several local Managing Directors in Uruguay, Chile, Colombia, Argentina and Mexico, including Fernando Fabre, who was leading the Mexico office at the time. In 2013, when I was working at JPMorgan in New York, Fernando contacted me to make some connections in Spain, where Endeavor was looking to expand. By the end of that year, I was asked to submit my candidacy for the Endeavor Spain MD position. At first I wasn’t convinced about leaving a senior position at a leading investment bank in New York to move back to Spain. But I wanted to support my country and I truly believed in the Endeavor model. I decided to go for it. I have never looked back ever since. E: What experiences from launching and managing Endeavor Spain will you take into your new role? A: The first fundamental lesson I learned is to surround yourself with really good people — people who inspire you, who are motivated, and who are true to the organization and the mission. At the same time, those are the people you’ll do anything for. I feel very much in debt to my team, past and present, in Spain. In my new role I am very much looking forward to engaging with teams globally. E: What are some of the most important lessons you’ve learned from entrepreneurs, peers, or mentors in the Endeavor network? A: There are important lessons in each category. From entrepreneurs, I’ve learned that success is a team sport. Most entrepreneurs start early-on obsessing with capital and funding, but that shifts to talent as soon as the company scales. The most meaningful discussions we’ve had have had to do with talent development, attraction and retention. From mentors, I’ve learned the meaning of selflessness. Our mentors go out of their way for our entrepreneurs, from taking hours of their busy days, to traveling to ISPs, to vouching for our entrepreneurs with their peers — and this is all based on interactions we facilitate. Lastly, the biggest lesson I’ve learned from my peers since day one is that, when you join Endeavor, you join the #OneEndeavor family, and that’s something we never lose. E: Over the past two decades, the Endeavor network has grown from just a handful of entrepreneurs in a few countries, to over 1,700 entrepreneurs in 30+ growth markets. What is your vision for the future of the high-impact entrepreneurship movement, and where Endeavor has opportunities to grow? A: When I look where we are now and think of what we were in 1997, I can’t help but get vertigo. We always talk about thinking big, but what Linda and Peter drafted on that famous napkin is now an amazing organization present in 35 markets, and aiming to be self-sustaining in the very near future. Outstanding entrepreneurs, board members, mentors and staff are the blood in our veins, and we’re hungry to find more high-impact entrepreneurs in the economies where we operate and those in which we will. Given the direction of the world we live in, I can’t see this movement stopping anytime soon. The sky’s the limit. E: What are you most looking forward to in your new role? A: I’m very much looking forward to meeting new people, and getting a deeper understanding of new cultures. Thanks to my previous jobs, I’ve been able to get to know Latin America, North America and Europe quite well, and that has deepened during my time at Endeavor, but I am very much looking forward to getting a better understanding of Africa, Middle East and Asia. E: What quintessential New York food are you most excited to eat?